I’m a fan of Bhikkhu Bodhi in real life, and also on his Facebook page. That’s how I heard about this story which he posted on Facebook this past Thursday, July 29. Buddhist Global Relief is the organization that Bhikkhu Bodhi founded in 2008, dedicated to the mission of providing relief to the poor and needy throughout the world regardless of nationality, ethnicity, gender, or religion. This past month, Buddhist Global Relief (BGR) received a unique honor in being requested to join a task force on interfaith action to alleviate poverty and combat illness around the world. The first meeting of the task force took place at the White House on July 26th. The task force is intended to spearhead the Global Initiative for Faith, Health and Development, an international project guided and organized by the Center for Interfaith Action (CIFA), based in Washington. The Global Initiative was launched in response to President Obama’s call for the world’s religions to collaborate on issues of humanitarian concern. Its objective is to produce a strategic framework for advancing and multiplying inter-religious cooperation on action against global poverty and illness. The task force brings together the world’s most prominent faith-based relief organizations for the purpose of designing the framework. In appointing the task force, CIFA wanted to broaden the range of the Global Initiative by including delegates from other religions besides the three Abrahamic faiths—Judaism, Christianity, and Islam. After a careful review, they chose BGR as the most suitable Buddhist organization to serve in this role. Though BGR has been in existence for only two years, the organizers were impressed by its significant achievements and the broad reach of its programs during such a short period of activity. CIFA invited BGR chairperson Ven. 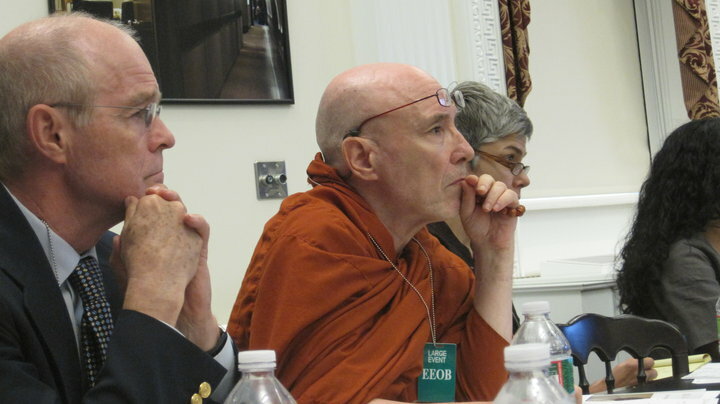 Bhikkhu Bodhi and executive director Kim Behan to participate in the first meeting of the task force, held at the White House on the afternoon of July 26th. The meeting opened with words of welcome and encouragement from Rev. Josh Dubois, head of the Office of Faith-Based and Neighborhood Partnerships under President Obama. The conveners of the meeting then gave a broad presentation of CIFA’s plans to increase interfaith collaboration, illustrated by detailed charts and diagrams. This was followed by a lively exchange of views and comments from the members of the task force, with appreciated contributions from Ven. Bodhi and Kim Behan. In the course of several future meetings, the task force will design a strategy to strengthen the contribution of the religious sector to poverty alleviation and global development. The next meeting will be held on October 4th at the United Nations in New York. This will be followed by a two-day session in November, to be held at the Washington National Cathedral and the White House. At this session, the participants will finalize the design of the strategic framework. The hope is that the framework will create a clear plan of action for different faith communities to work together in addressing the problems of poverty, hunger, and disease. We at BGR feel privileged to be able to share in this worthy effort. We believe this appointment marks a significant recognition of BGR’s attempts to address the plight of the poor around the world. We hope that by participating actively with other faith-based organizations, we can make a significant difference in the lives of the marginalized sector of humanity. Posted in Politics, SEB News and tagged Bhikkhu Bodhi, Interfaith, Poverty. Bookmark the permalink. For too long Buddhists have spent much time on the cushion and not enough in the world (but not of it). BGR has been a tremendous example in their short 2 years. I was struck years ago when Bhikkhu Bodhi issues his challenge for Buddhists to DO SOMETHING about suffering in the world. “When we bear witness, when we become the situation—homelessness, poverty, illness, violence, death—the right action arises by itself. We don’t have to worry about what to do. We don’t have to figure out solutions ahead of time. Peacemaking is the functioning of bearing witness. Once we listen with our entire body and mind, loving action arises. Thanks for your comment, and so glad to hear that you are going to the Gulf with Penny and the other Upaya Chaplaincy students. I look forward to covering your trip there in The Jizo Chronicles.